Seems there has been a flight "reassignment", and now our flight is leaving at 1:01am. I don't really mind the fact that it's departing at 1:01am...if we have to look at a bright side, it may save us a night's accommodation costs. But arriving in Mexico City at 4:42am doesn't thrill us very much! What are we supposed to do in Mexico City at that hour? And without much in the way of sleep. I guess we'll just make the best of it and hang around the airport until the first bus runs into downtown. Maybe we'll find a couchsurfer who's home we can arrive at early in the day. I'm sure we'll figure it out...it's all part of traveling. Ruth's cousin Helen and her husband Tony live in England, and they are coming to visit us in Mexico this winter! The flights are booked and they arrive Mexico City January 14th for two and a half weeks. Fantastic!! This will be our 7th winter in Mexico, and in all that time our daughter and grandson visited once and our son visited once. None of our other family or friends have ever come down so that we can show them the real Mexico. By that, I mean the Mexico away from the all inclusive resorts and tourist and expat places. So, we're super excited about this. 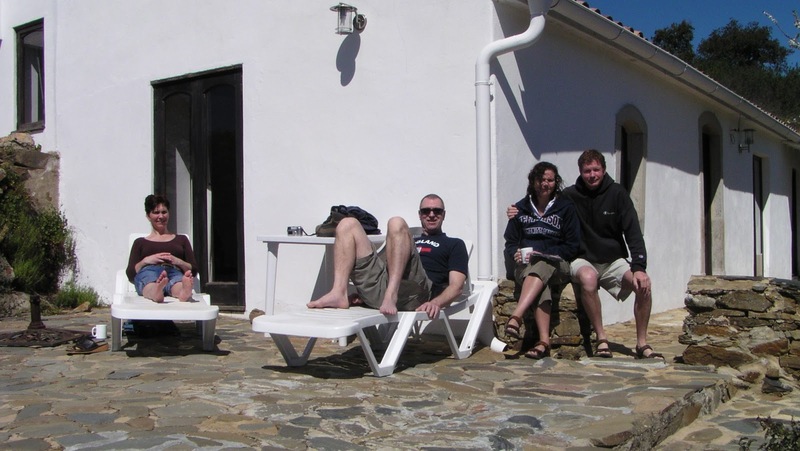 Helen, Tony, Ruth, and Kevin in Portugal. March 2007. We've traveled with Helen and Tony before, so we know that we get along. It'll be a little tight in Sherman, but we'll figure it out. In March of 2007 we rented a cottage in Portugal with them, and they have come to Canada a few times to visit us, and we've gone to England a few times to visit them. Way back in 1987 we rented a cottage in Scotland together. So we have a long history of good times together! Here we are at their place in England in July of 2012. The last time we saw each other was in September of 2012, so it's been a while. We always have quite a few laughs together, so we can't wait to see them in Mexico! Get your wi-fi range boosting antenna for your RV travels this fall and winter! We own one of these antennas and it is the best wifi antenna we have ever used! So are we and I am pretty sure that there will be lots of laughs! you're right bad news not so bad. Hey so it will be a tight fit you'll all have fun together. and probably have more than one laugh about tripping over each other. Perhaps by the time you clear Mexican customs the early buses will be running. I hate it when they change flight times that much - even worse if you have connecting flights. We have 3 flights to get from Vancouver Island to Malaga in the Spring and I am hoping they don't change too much by April. Nice to see relatives - even nicer that they are meeting you in Mexico! Luckily there is no connecting flights to worry about. I am sure it won't be an issue, it is just a little frustrating because the original times were perfect for us. Hoping that all your flights will go well in the spring. We are really looking forward to showing Helen and Tony Mexico and having them meet some of our Mexican friends. We are going to have a blast with them. Plans are written in chalk and to live this lifestyle we need to be adaptable. Sounds like an interesting winter. Yep, it should be a fun winter! When you book flights so far in advance I'm not surprised at changes. That has happened before! Glad Helen and Tony are going to visit you. Yes, it has happened to us before but not too many times, thankfully. We are happy they are coming to visit too! Always great to spend time with compatible people. We just did the same with friends we've known for 40+ years. ENJOY! You are totally right Dianne. Glad you had a fun time with your friends as well. Take the metro at the airport to the Zocalo and have an early breakfast. If you arrive at 442 a.m., by the time you get our baggage and get downtown it will already be 7 a,m. You are probably right Chris. It is still a while away and the times could change again, so we will just play it by ear. Mexico in winter with friends -- oh boy! Hope that flight rearrangement is your only glitch! We hope that the flight times are the only glitch too! It should be a very fun winter, with lots to look forward too.